Sunken UFO | Paranormal Forum: " Where paranormal, science, and spirit meet"
Discussion in 'UFO and Aliens' started by Debi, Aug 29, 2016. 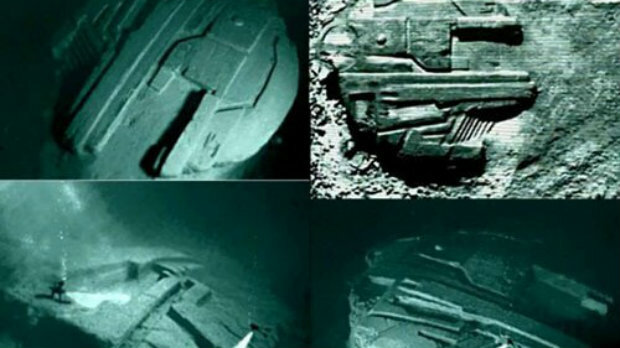 In the summer of 2011, researchers uncovered a very large and unusual object deep in the Baltic Sea. The artifact’s shape is almost perfectly oval and it totals 60 meters in diameter. The first odd thing you can notice even from afar is that a still visible trail leads to the huge structure, which means it wasn’t there when the region wasn’t covered in water (millions of years ago) and it didn’t sink there either (if a vessel could even carry such a thing). Ocean X, a private firm which works in the field of ocean exploring and treasure hunting, sent a ship to look for possible wreckage in the region, and their sonar revealed this strange formation that was too close to being round to be just a natural rock formation, as many have since claimed. The crew claim that when in proximity to the UFO, especially when directly above it, most of the electric devices onboard were instantly turned off. So two divers, Denis Asberg and Peter Lindberg went under to explore it, and what they found was even more amazing. Not only did they see the trail, but the large object had very straight and smooth walls and a stairway leading to the top platform. Also, they discovered a sort of an entrance of surprisingly symmetric oval shape. “The surface is cracked, three is a black material that fills the cracks but we are unsure what this material is,” Peter Lindberg declared in an interview with FOX News. In 20 years of work in the field, the two divers had never seen such a thing. It was the length of a commercial airliner, and the trail leading toward it gives hints of a possible crash and skid along the sea floor. Sediments gathered from the object’s surface could be dated to more than 14 000 years ago, which led historians to believe we’re dealing with another advanced ancient civilizations, such as the Sumerians or the Incas. On the surface, the explorers have also reported seeing carvings like shapes they say don’t appear to be natural. The wreckage sits at a depth of 90 meters and waters in the area are always muddy, factors that make it virtually impossible to film or photograph the site. When all the crew was back onboard and they had reached a considerable distance from the site, the electronic equipment suddenly started working again. This is truly fascinating. I hope to hear more about this. Considering all the silly programs the various TV networks have funded since "reality" paranormal/UFO shows have become popular, it's hard to believe there hasn't been one for this story. Yes, producing the program would be very expensive, but if this turns out to be what some are claiming, it would literally be a historic event of epic proportions. it would literally be a historic event of epic proportions. In other words, people screaming in the streets and jumping off cliffs. Maybe somethings need to stay under wraps for awhile. Maybe the production team can just release their findings and edited program exclusively to the PNF. We are an enlightened bunch after all with very even temperaments. what I don't get is the stairway....why???? I don't mean to be a total nerd, but I can't help but think how much that thing looks like some of the capital ships in the new Start Trek series. Side by side view. Let's be nerdy.